The No BS Road To Remote Work is Remote Like Me's signature course that teaches strategies on how to find remote work, including freelance gigs, full time + part time positions on remote teams, and other types of contract work. 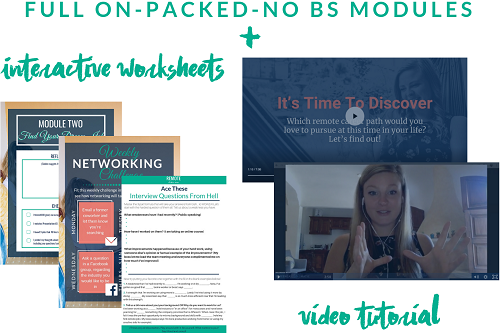 Throughout 7 course modules of videos and worksheets, you'll learn where to find these opportunities, how to get noticed by remote companies, and how to land the job every time. Each module builds upon the last, creating your focused path to becoming a remote worker. - College graduates who don't want to enter the corporate lifestyle. - Travel addicts who need a location independent career so that they can start their Digital Nomad lifestyle. - Entrepreneurs and coaches just getting started who need steady income from a part time remote job. - Exclusive Facebook Support Group - coming Jan 1st! - Hacks and shortcuts to make job searching and applying fun and fast!